Do you know what it feels like to wake up early in the morning and find out that a good thing that you expect is coming right? If so, then you understand how I felt when this morning I finally managed to watch the animated movie “Clone Wars” - the movie that I wanted to watch so much, but never went to the cinema to see it. I had forgotten about it for a while, but then I saw it in the movie store. Well, true, it was a little costly, but I gave the extra cash to see this movie from my favorite saga. So I waited eagerly for the end of the day to be able to watch this work of Lucas Arts, directed by Dave Filoni. Despite a slightly different beginning of the film against the original six episodes, I wasn’t left disappointed. quite angular, the animation of the film is incredible. I even felt that at times it did not seem to be animated at all. I would go even farther: some of the sights in the film are even more impressive than those in the feature films, and the mass battles are perhaps the most spectacular in the whole saga. Exactly after the end of such a battle, Anakin and Obi-Wan are ordered with a new task - to find out who kidnapped the son of Jabba The Hutt and save him before the Tattoine Hutt who looks like a snail thug get angry and join the Separatist cause that gather on their site new and new worlds under the command of their leader, the ruthless Count Dooku. On top of that Yoda gives to Anakin a new special task - the young, exuberant Ahsoka which becomes his padawan. they are what they are and what they had to stay - the greatest heroes of the galaxy, brave to rashness, skilled both in tactics and with the lightsaber, good friends and always winning. 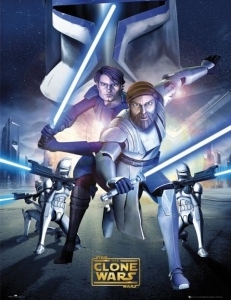 I seen this movie “Star Wars: The Clone Wars”, and the characters with the special effects are outstanding and out of this world I recommend this movie to anyone in the world who love Star Wars movies.